Astronaut. Professor. United States Naval Aviator. First man on the moon. 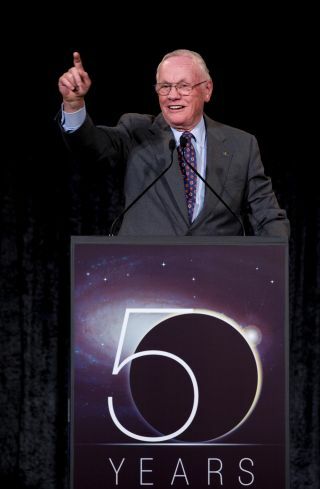 Neil Armstrong, a man who is all these things, addresses guests at NASA's 50th anniversary celebration in 2008. A congressional committee will hold a hearing this Thursday (Sept. 22) to discuss NASA's human spaceflight activities, with Neil Armstrong — the first person ever to walk on the moon — among those to give testimony. The House of Representatives' Committee on Science, Space and Technology will meet from 10 a.m. to 12 p.m. EDT Thursday (1400 to 1600 GMT). The hearing is entitled "NASA Human Spaceflight Past, Present and Future: Where Do We Go From Here?" Neil Armstrong: Armstrong, commander of NASA's Apollo 11 moon mission, became the first human to set foot on a world beyond Earth when he stepped onto the lunar surface on July 20, 1969. Armstrong has been an outspoken critic of the Obama Administration's decision to scrap NASA's Constellation program, which aimed to send astronauts back to the moon by 2020. Last year, Obama instead directed the space agency to work toward getting people to an asteroid by 2025, then on to Mars by the mid-2030s. The SLS, and NASA's crew-carrying Orion Multi-Purpose Crew Vehicle, are designed to carry astronauts to these deep space destinations. Gene Cernan: Former astronaut Cernan is a veteran of three spaceflights. He was the commander of Apollo 17, NASA's final moon mission, and is the last person to have left footprints in the gray lunar dirt. Like Armstrong, Cernan has expressed displeasure with the cancellation of Constellation and NASA's future direction in human spaceflight. Mike Griffin: Griffin was NASA Administrator from 2005 to 2009 and is currently a professor of mechanical and aerospace engineering at the University of Alabama, Huntsville. Griffin also opposed the scrapping of Constellation and has said the Obama Administration has not supported human spaceflight. Maria Zuber: Zuber, a professor at MIT, is principal investigator of NASA's Grail mission to the moon. Grail, which launched earlier this month, aims to map out the lunary gravity field in unpredecented detail. The goal of the Grail mission is to shed light on the moon's structure and evolutionary history. The House Committee on Science, Space and Technology is made up of 23 Republicans and 17 Democrats. It is chaired by Ralph Hall (R-Texas).